So many choices… So many combinations! 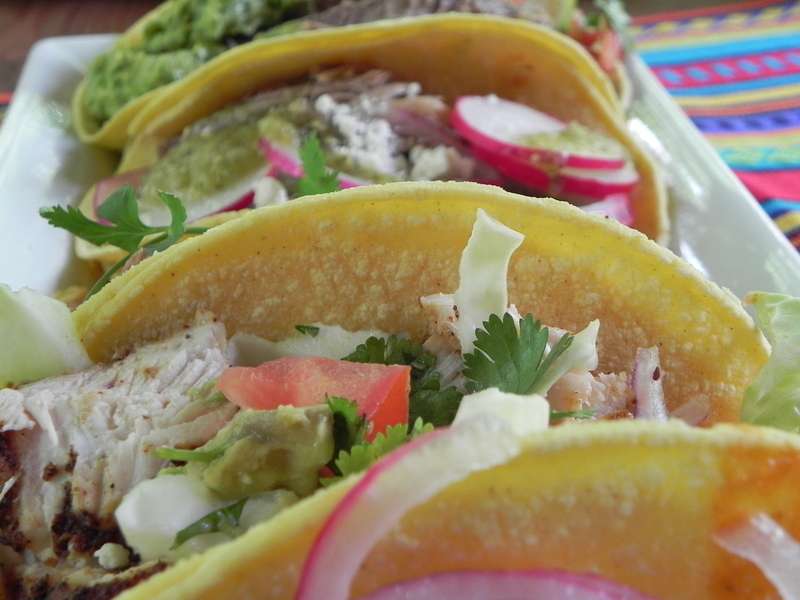 Since I got home from visiting Jenn in Southern California, I have been trying to replicate the fabulous tacos found in tons of little joints all over her neighborhood. Since the weather is always 75 degrees and sunny, everyone there seems to be out doing some kind of exercise – running, yoga on the beach, surfing, hiking – and they all look great while doing it. The temperature is too nice to be able to hide figure flaws under a large bulky sweater, so the people look fit and lean. The food reflects that sensibility as well. A farmers market can be found somewhere close by every day of the week and California cooking uses all the wonderful produce grown close by. We had some kind of tacos every day I was there and they are nothing like the heavy, ground beef ones in the Midwest. Basically there are many protein options: chicken, beef, pork, fish, or seafood. 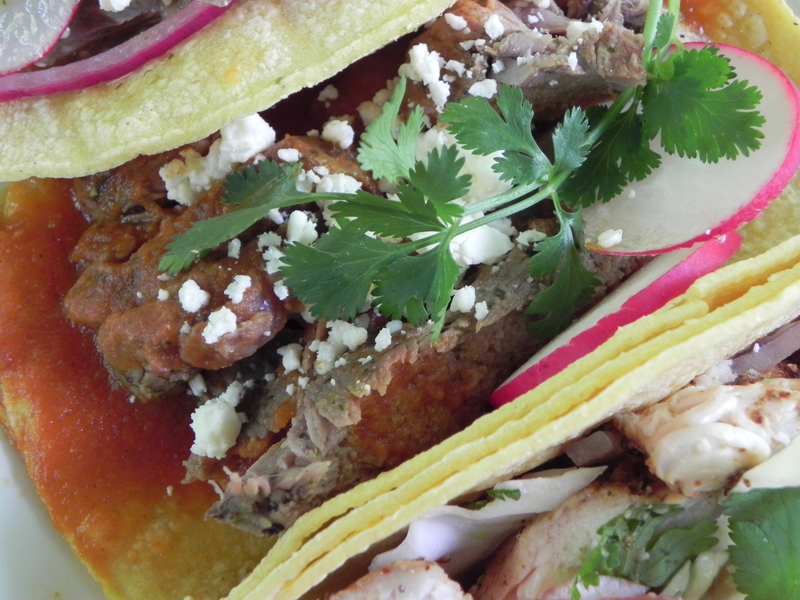 They are either seasoned with spices or marinated before being grilled or slow cooked. Then comes the choice of tomatillo or red sauce and which garnishes such as fresh salsa, guacamole, or cabbage salad to use; all the different choices remind me of a probability math problem! 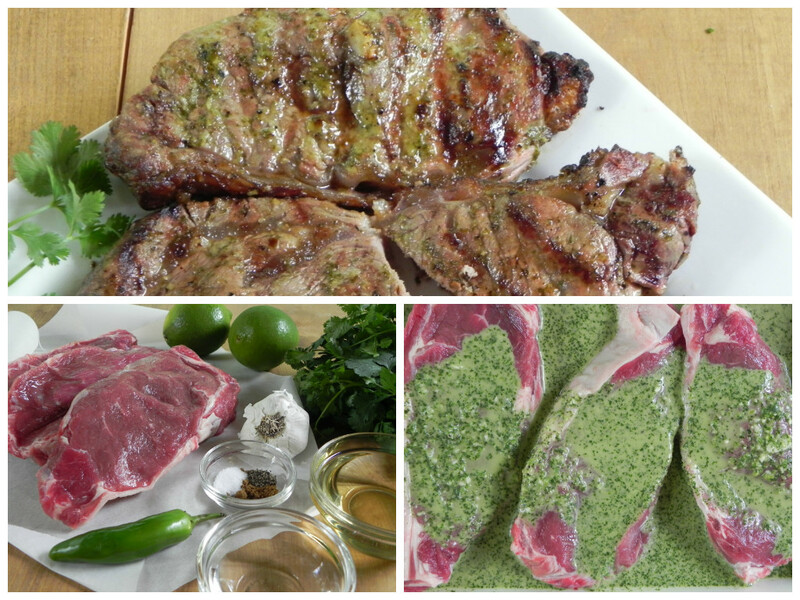 This post features my favorite combinations, but any of the meats could be prepared using any of the methods below. Likewise, they could be paired with any of the sauces. I’d love to hear about anyone else’s favorite! Enjoy! Preheat the oven to 325 degrees. Mix together the chili powder, cumin, salt, pepper, and garlic powder. If the roast is tied with any string, cut it off. Rub the spice mix into the meat. Place the meat into a 9 by 13 or similar oven safe dish and pour in the broth. Cover the pan with foil and place in the oven. Bake for 4 hours. 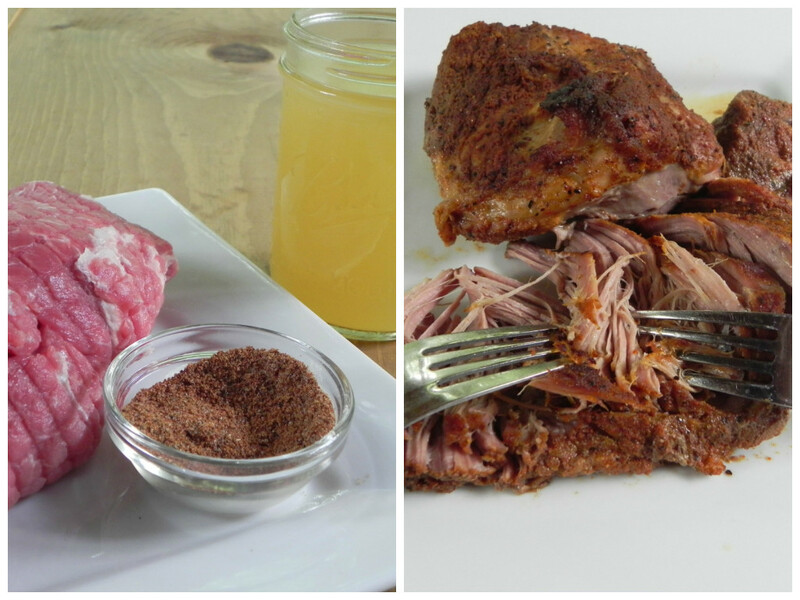 When done baking, lift the pork out of the liquid and put on a serving platter. Take two forks and gently pull the meat apart. Peel the papery skin away from tomatillos and rinse them off. Boil in salted water to cover for 10 minutes. Carefully remove them from the boiling water and put in food processor (or blender if you don’t have processor) along with cilantro, onion, chili, and garlic. Process but leave some texture. Place the oil in a pan and place over medium heat until it becomes hot. 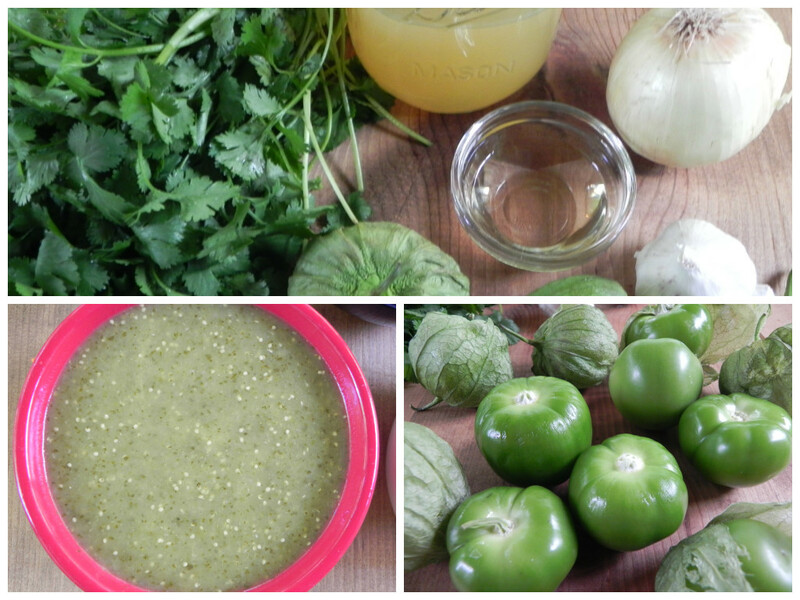 Pour all the tomatillo mixture in at once and stir constantly for 4 minutes. Then add the broth, return to a boil. Reduce the heat to medium/low and simmer for 10 minutes – stir every so often so it won’t burn. To make the pickled red onions, all I do is peel and thinly slice a red onion. I put the slices in a bowl and pour in plain old white vinegar to cover. Some people mix in a teaspoon of salt and a teaspoon of sugar to two cups of vinegar when they pour the vinegar over the onion slices, but I just don’t want the extra salt or sugar and I don’t miss it in the taste at all. For garnishes slice some limes and washed radishes, crumble some cotija cheese, and include some cilantro sprigs. 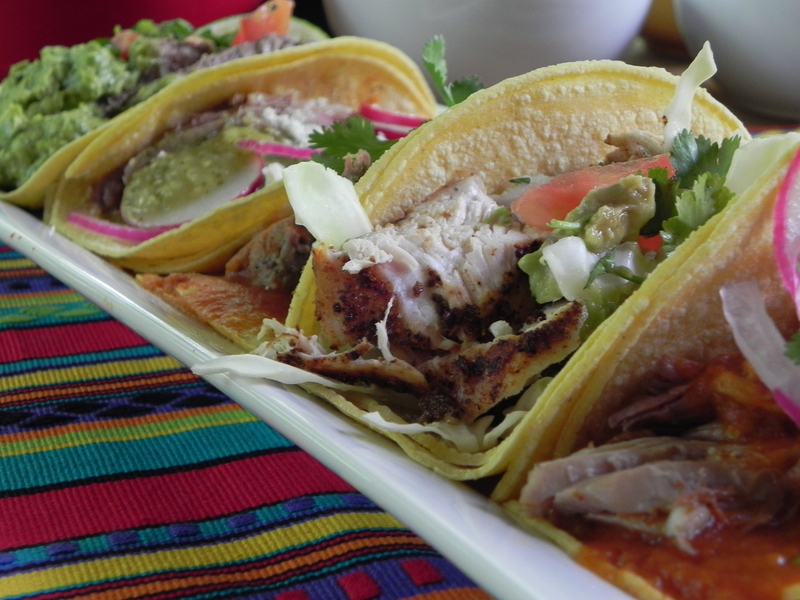 Assemble each taco by doubling up two small corn tortilla and stuffing them with the pork and sauce, & garnishes. This is even better if you “butterfly” the steak by cutting it in half through the middle so it becomes thinner. Place the steak in a shallow container such as a 9 x 13 dish. Whirl the rest of the ingredients in a food processor or blender and pour over the steak. Cover with plastic wrap and allow it to marinate for 20 minutes at room temperature or 2 hours in the refrigerator. Grill over medium low heat for about 5 to 7 minutes per side, according to how rare is desired. Let the meat sit for about 5 minutes after taking it off the grill, and then slice it into strips. Rinse the chiles under cold water and pat dry. Toast them in a dry pan, turning them over until you can see they are browning but not burnt. Take them out of the pan, and when they are cool enough remove the stems. Set them aside for a minute. Heat the oil in a pan over medium heat and add the diced onion. Saute the onion until it is tender, then add the garlic and cook for another 30 seconds. 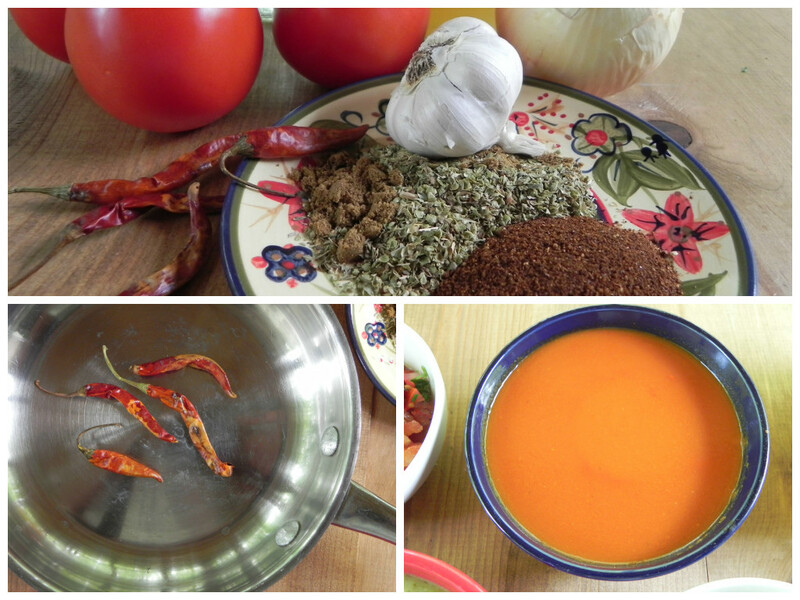 Add the tomatoes, oregano, cumin, broth, and chilies and bring it to a boil. Turn down the heat and let the mixture simmer for 15 minutes. Remove from heat, allow to cool slightly, and transfer to blender or food processor. Whirl until well blender, then pour the mixture through a wire mesh strainer, and back into the pan. Add the tomato sauce, bring it back up to a boil, then turn down the heat, and simmer for 15 additional minutes. Taste before serving to see if salt needs to be added. 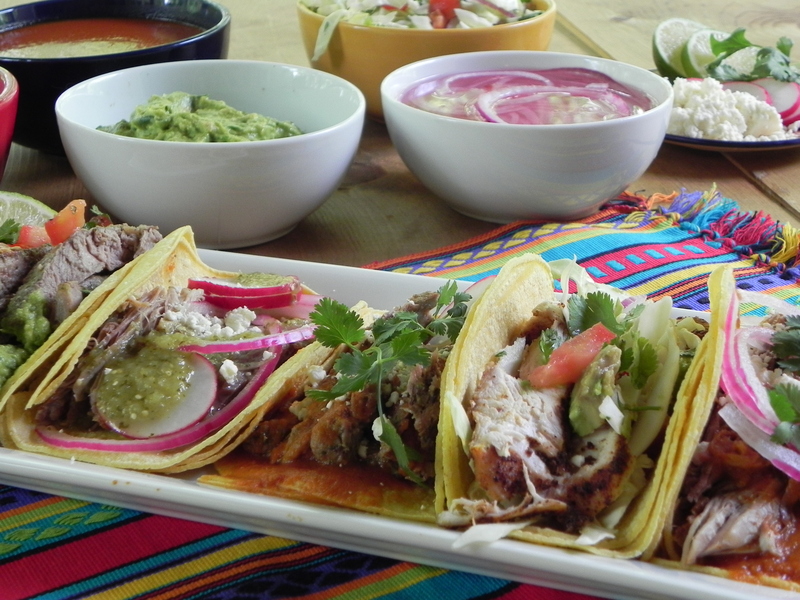 To serve, wrap the steak in a double corn tortilla, add the red sauce and garnishes of lime slices, cotija cheese, radish slices, and/or fresh cilantro leaves. 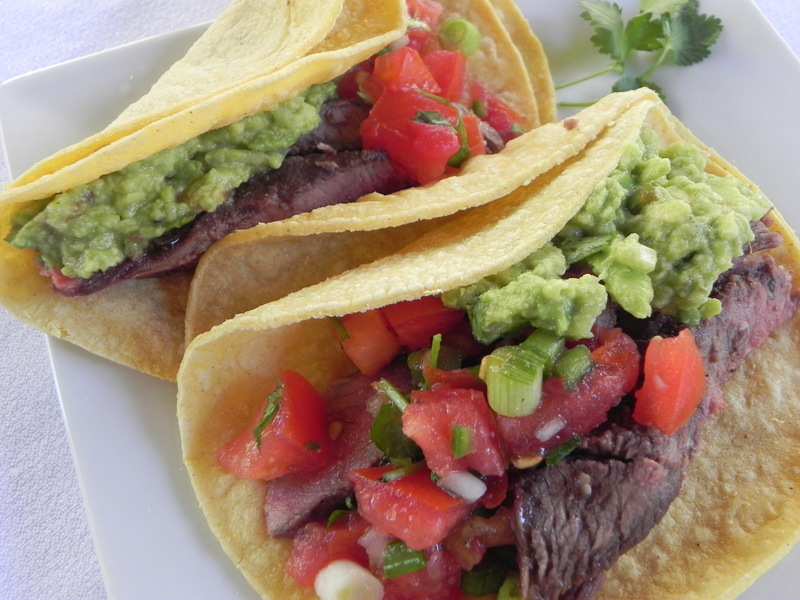 Or for Variation # 2.5, serve with guacamole and fresh salsa as shown in the photo below. Great versions of guacamole and fresh salsa are in this post CLICK HERE on the Yates Yummies blog. Rinse and pat the chicken pieces dry. Combine the chili powder, cumin, salt, pepper, and garlic pepper. Rub into the chicken. Grill over medium low heat until juices run clear. For chicken breasts, I usually cook them 10 minutes per side – it depends how thick they are. I often cut into one to make sure all the pink inside is gone. 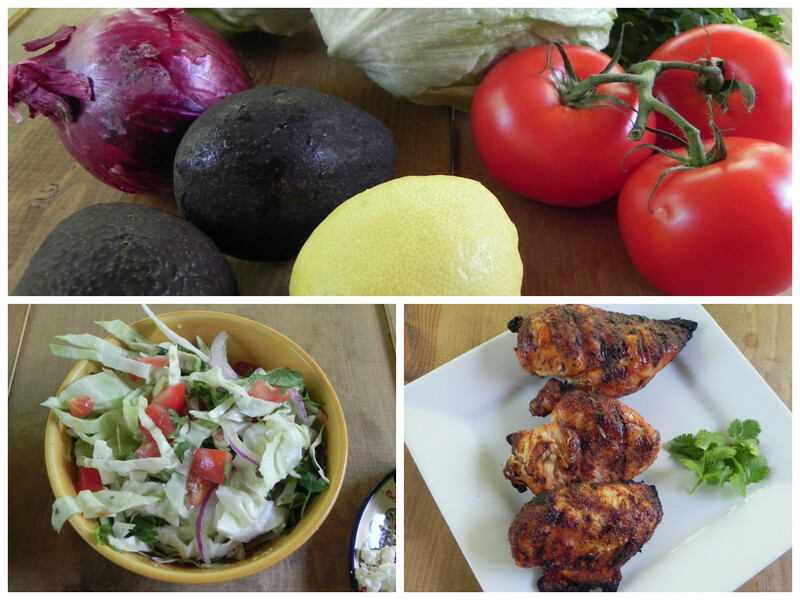 Take off the grill and slice the chicken into strips. Peel and slice the red onion. Place the onion in a small bowl and pour the vinegar over it. Let this sit while you are preparing the rest of the salad. Wash and cut the cabbage and lettuce so it looks shredded or in bite sized pieces. Place in a large bowl. Core and chop the tomatoes. Add them to the lettuce/cabbage in the bowl. Chop the cilantro leaves and add them to the bowl. Cut the avocado into chunks and squeeze juice from the lemon over it before adding it to the bowl. Lift the red onion out of the vinegar (don’t throw it away!) and place in the bowl. Take 1/4 cup of the vinegar the onion was sitting in and whisk it into the olive oil, salt, pepper, and garlic powder. Add the resulting dressing to the salad and gently toss it. To serve, place about 1/4 cup of the salad into double corn tortillas. 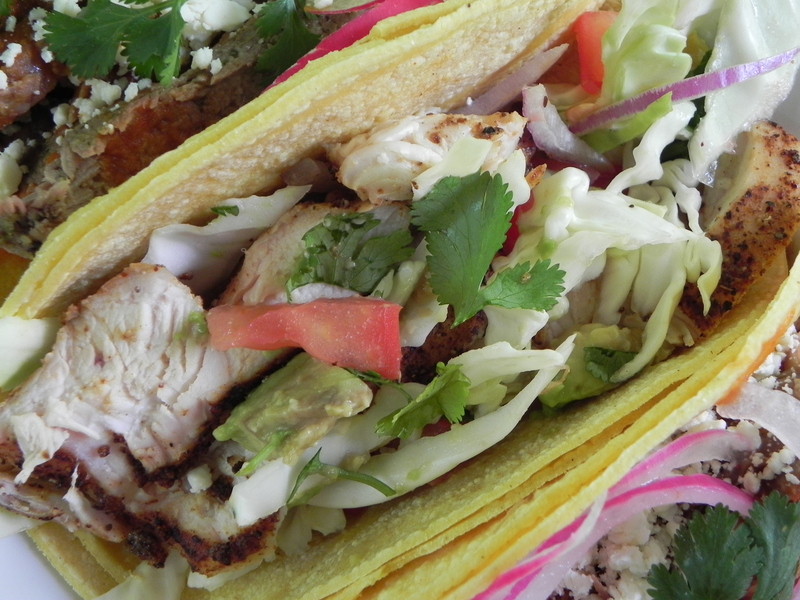 Add the chicken strips and some cotija cheese. 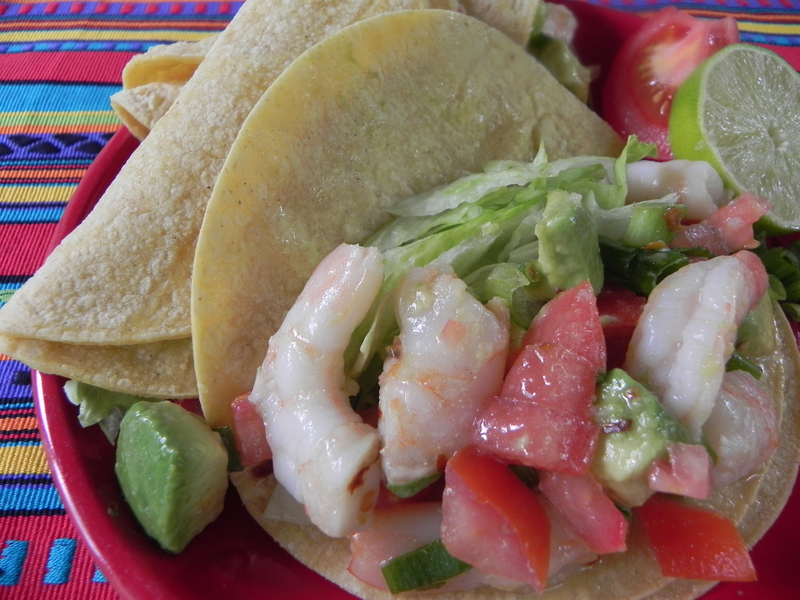 Click HERE for super easy but super tasty recipe for lime marinated shrimp taco on the Yates Yummies blog. My obsession with acai bowls got renewed last week when I was visiting Jenn is SoCal. It had been an interesting morning. When I woke up in our hotel, my foot landed in a great big wet spot on the carpet. We were staying at a nice family oriented spot and the one of the washer units housed next door to us was probably leaking. It was really unpleasant so I called the front desk. They apologized profusely and offered to upgraded us to a “Junior Suite”. So we packed everything up and moved across the property into a very spacious room – nice problem to have – right? Caroline was staying with Jenn at her place and we had agreed to meet to go to the farmer’s market. I was thinking we might end up having breakfast there, but after all the scrambling around I was pretty hungry. (And ashamed to admit, maybe a bit crabby too.) There is a cute little cafe just across from Jenn’s beach house that serves acai bowls so I suggested that we grab something there. I had forgotten how refreshing and yummy they were! They are perfect in hot weather and I was telling Caroline how last summer I made one for about 26 days in a row. The lady at the table next to us stopped trying to look like she wasn’t eavesdropping and jumped right into our conversation. We had a big chit chat about methods, ingredients, and how wonderful California is. My version of an acai bowl is posted here. It might now be 100% authentic, but it sure is tasty! Then spread the mixture evely on the baking sheet and bake for 15 minutes, stirring twice at 5 minutes and 10 minutes. 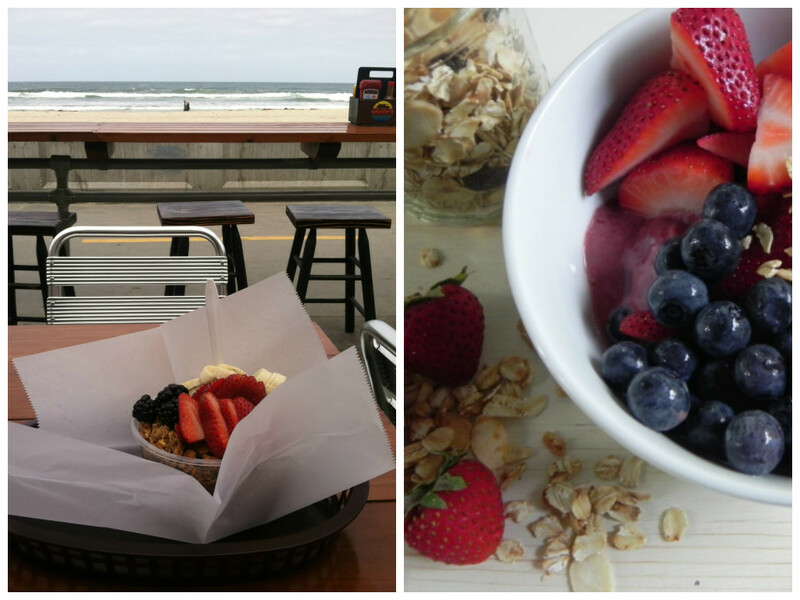 Allow to cool while you whirl up the acai bowl. 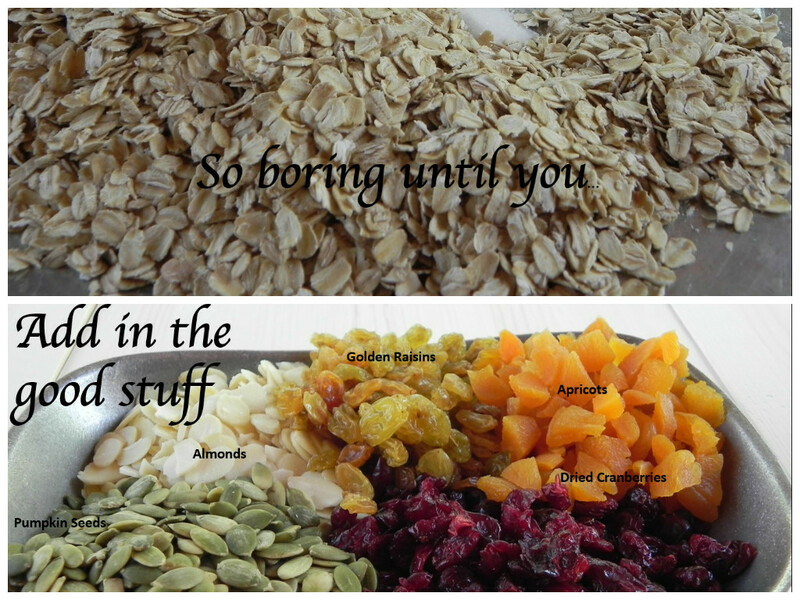 Use a blender to combine 1 (3.5 oz.) 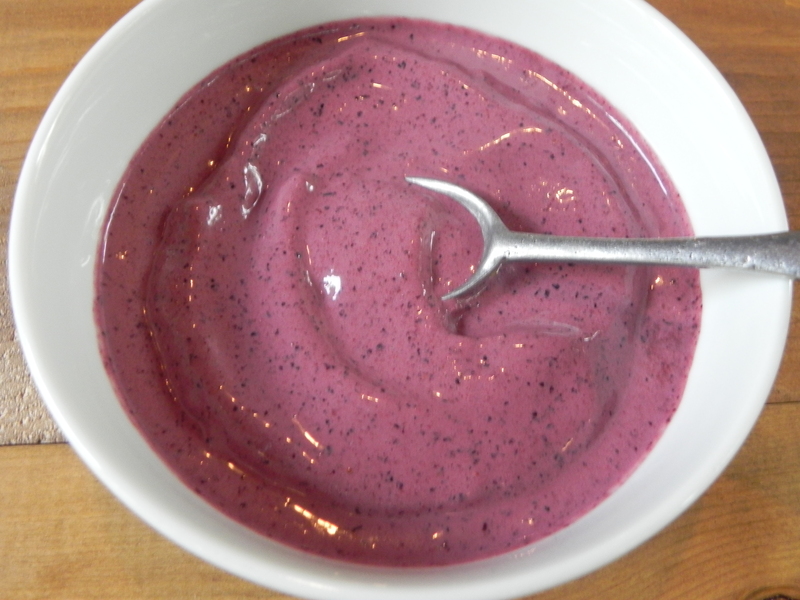 packet of frozen acai puree (I found it at Whole Foods) which is slightly thawed, 1/2 cup plain Greek yogurt, 1 cup frozen fruit such as bananas, blueberries, mixed berries, raspberries, etc. The trick is to get it to the consistency of sorbet. The blender may have to be stopped and the mixture might have to be stirred a few times to get it all blended. Divide the mixture between two small bowls or one large one. 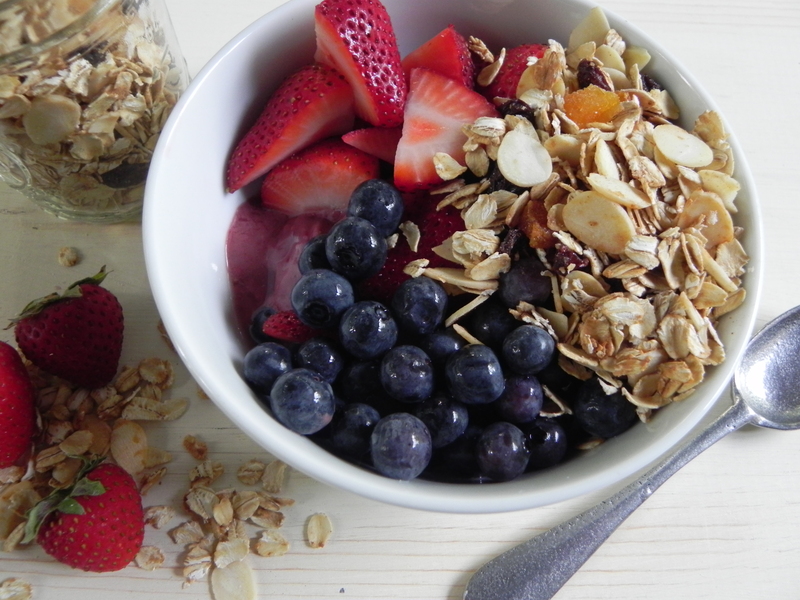 Top with fresh berries or bananas and granola.